Some 150 years in the wake of Frederick Douglass’ landmark interviews with President Abraham Lincoln, on a nippy weekend morning before Veteran’s Day, 2013, I experienced the overwhelming urge to visit an important Civil War battle ground site where black Union troops had fought with lasting distinction. The site was not far from where I live in Henrico County, near the Varina district, on the outskirts of Richmond, Virginia. So, on that brisk, invigoratingly cool Saturday morning, along with my wife and one of my grandsons, I hopped in my pickup truck and set out on another one of my favorite retirement adventures, a history-oriented road trek back to colonial times. As the blended rust-orange, red-and-yellowed Autumn leaves trickled down, as if by invitation, the teasing breeze seemed to work in tandem with the scenic rural roadway. It covered the approaches to this hallowed ground, like magical snowflakes in the fall. But, it really wasn’t too difficult to locate, since I often passed its related roadside marker. It was the kind of commemorative plaque I’ve seen many times, as a former public utility investigator, traveling many miles– and, a few centuries– deep inside the colonial countryside of Virginia and North Carolina– seemingly with never enough time to stop. Yet, this particular scenic route– Virginia’s State Route 5 (dubbed the Virginia Plantation and Battlefield route), coupled with U.S. Route 17 (which linked the Great Dismal Swamp and many of the “missing pages” to Western Hemispheric Maroon Societies and runaway slave life, from southeastern Virginia and North Carolina to Florida and Northeast Brazil) was strikingly inviting and among the most memorable landscaping I’ve been blessed to witness. The bright Virginia fall foliage was simply icing on the cake. That was the profound reality for black soldiers and black citizenry back then, and other times in our nation’s history, as we proudly wore various armed forces uniforms, adorned with military patches– and, the American flag— in the ongoing fight for freedom, as well as equality and dignity. 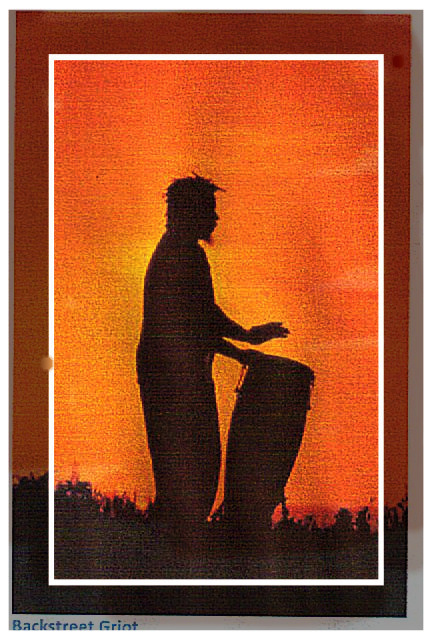 But, over the years, my personal experiences with racism, and the various slights and indignities I’ve run across, have helped me to further understand the battles my ancestors fought within racially hostile environments, military and civilian. 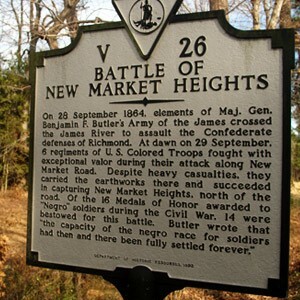 Accordingly, I often thought of the Battle of New Market Heights, since the dates of the Civil War skirmish coincide with the month and day I was born. But, a local newspaper’s recent drip-drip-drip of daily Civil War commentaries and dispatches, promoting the valor of white soldiers, had become a bit much for my sense of taste. Especially gnawing was the missing footnotes of black Civil War valor. It whetted my appetite for the raw backstory I often look for while thinking through America’s past, not found in classroom history books. So, all of a sudden, the often obscure roadside marker, especially at 55 m.p.h., came into view that morning, overshadowing any plans I had for that day. Impressive. But, I still wasn’t satisfied. In fact, I was a little irked that the “footnotes” documenting the backstory to this significant battle was not mentioned. At least, it was a backdrop significant to me and probably many other African-American military veterans and their families, as well as the families of many white veterans who fought courageously during this encounter. The seemingly dirty little secret to this battle, in my opinion, was not just the suppressed history of the Medals of Honor awarded to black soldiers, but the vulgar events which led up to this attack, as well. Some historians call it “the revenge for Fort Pillow.” But, that battle, the Battle at Fort Pillow (a.k.a., the “Fort Pillow Massacre”) was simply an ugly mass slaughter of black and white troops. It took place on April 12, 1864, at Fort Pillow, Tennessee, about 4 hours west of Chattanooga (TN), where my mother was born, and 4 hours southwest from my own birthplace in Frankfort, Kentucky. To me, it was the missing “footnote” to the Battle of New Market Heights. Regardless of what Southern whites called them, both (Turner and Brown) were Abolitionists– “freedom fighters,” in my book– who rebelled against the disgusting horror and harshness of slavery. In the process, many whites were killed for the cause of freedom that Turner and Brown believed in. In my opinion, it was like another war within the nation’s war with itself, before the terrible military aggression and cultural conflict, between the North and South, even began. So, like flag bearers of Union Regiments, black Union Troops were forever in the crosshairs of Southern rifles and muskets. In fact, according to Civil War archives, in 1863, “the Confederate Congress threatened to punish severely officers of black troops and to enslave black soldiers. As a result, President Lincoln issued General Order 233, threatening reprisal on Confederate prisoners of war (POWs) for any mistreatment of black troops.” Yet, overall, black soldiers that were captured were still treated more harshly than white captives.Clearly, racists and racism were not elements foreign to Civil War battlefields. According to archives, except for General William T. Sherman’s storied invasion of Georgia, black troops took part in every major military campaign, in 1864 and 1865. However, it was at Fort Pillow, Tennessee that the battle cry of black soldiers, this side of the Mississippi River, became “Remember Fort Pillow!” Without a doubt, it was a massacre. The 292 black and 285 white Union troops, a mix of runaway slaves who manned artillery batteries and white cavalry units, which occupied the Union-held fortification, faced some 2,500 seasoned Confederate troops, led by General Nathan B. Forrest, who swarmed the fort and drove Union defenders into a deadly crossfire, allegedly under a fake flag of truce. Reportedly, only 62 of the black troops survived. Depending on which of the varying version you review, most of the Union soldiers were killed as they surrendered. Most of the surviving white Union troops later died in prisons. Civil War archives say that “Abraham Lincoln condemned the atrocity” but refused to agree to Union political demands that an equal number of Confederate prisoners should be executed in an act of revenge. In the official post-war investigation that followed, it was found that “the Confederates were guilty of atrocities which included murdering most of the garrison after it surrendered, burying soldiers alive, and setting fire to tents containing Federal wounded.” The South’s innovative Lt. General that led the assault– Nathan Bedford “Devil” Forrest— was recorded as never prosecuted for the war crimes, but later became the first Imperial Wizard of the Reconstruction-era Ku Klux Klan (Andrew Ward, River Run Red: “The Fort Pillow Massacre in the American Civil War,” New York: Viking Press, 2005). Confederate casualties were estimated at no more than 18 (86 were listed as wounded). Although later denied, Forrest reportedly boasted that the Mississippi River was “dyed with the blood of the slaughtered for 200 yards,” while his field commander bragged that the massacre taught “the mongrel garrison” a memorable lesson, according to Ward (“River Run Red”). than did those negroes.” The vicious battle, which actually took place at Chaffin’s Farm, at New Market Heights, was later listed in Civil War archives “as one of the most heroic engagements involving African-Americans.” After being pinned down by Confederate artillery fire for about 30 minutes, black soldiers charged the earthworks, rushing up the slopes of the heights, suffering tremendous casualties. Fourteen (14) Medals of Honor were later bestowed to them for this battle, among the 16 Medals of Honor awarded to black soldiers for the entire Civil War period. And, in spite of the many buried footnotes and “missing pages” of our nation’s complex and bloody history, the unsung sacrifices of black Union Troops, and other veterans that preceded me, black or white, still brings tears to my eyes, as well as a powerful swelling of pride. That’s why I felt the compelling urge, on that invigoratingly cool Saturday morning, to visit the New Market Heights battleground site.